﻿Lionheart Pilotage is a boat charter business, based in Jersey, Channel Islands and its primary focus is to support open water swimmers in their long distance swimming goals in and around Channel Island waters. Born in Jersey to a boating family, Matt’s passion for the sea was cemented at a very early age, learning to tie a bowline knot probably before the stabilisers came off his bicycle. Matt acquired his first small boat at the age of ten, allowing short, single handed trips out of his home port of St. Aubin. The arrival of his first engine powered craft at the age of twelve, extended his range out to several miles along the south coast of Jersey to the popular fishing grounds of Corbiere. In the thirty years since, Matt has gathered much offshore experience, skippering open RIBs across the English Channel and as far afield as Paris, a 1400km round trip. Back in Channel Island waters, Matt’s knowledge of the rocks, reefs and world renowned tides has been formalised by being awarded the Jersey Boatmaster’s Certificate by the local Port Authority. This endorsement goes alongside 15 years of working through the RYA training scheme, obtaining the Advanced Powerboat certificate as well as accreditation for first aid, sea survival techniques and VHF operation. Culminating in the award of the commercially endorsed RYA/DoT Yachtmaster Offshore qualification, which permits Matt to take passengers up to 60 miles from any safe haven. Large galley with oven, grill and two gas rings for boiling water etc for feeds. As well as another sink, there is also a large fridge with ice tray. Lionheart’s passengers are welcome to make use of all the onboard facilities. Built in 1978 by Guernsey Boat Builders, Lionheart is one of the world renowned “Nelson” family, a revolutionary hull design originally conceived by Peter Thornycroft in 1959 for Leopold baron de Rothschild, who wished to commute at 18 knots between his home on the Beaulieu river to the Royal Yacht Squadron at Cowes in any weather. That design has stood the test of time, still to be bettered as a fast and safe, all weather craft. Fitted with two modern Perkins turbo diesel engines of 300hp each, she is a powerful yet manoeuvrable boat for her class, with a top speed of 23 knots. Fitted with large “water trap” exhaust silencers, noise levels on board are very low and swimmers will be pleased to note that exhaust emissions are almost undetectable. In the wheelhouse there is seating for 6 people in addition to the outdoor space in the cockpit. We also have an onboard WIFI network. All your devices can connect to the internet at sea through this network via a long range 3G antenna, allowing you to keep family and friends up to date with the swimmer’s progress. There are also numerous 12 volt and USB charging points around the boat for keeping your gadgets powered up. The helm station is also extremely well appointed with all the latest in navigation and communications technology. This includes two touchscreen GPS chart plotters, radar, AIS transmitter, VHF radios and RDF (Radio Direction Finding) equipment. There are also instruments measuring a range of environmental conditions including wind speed and direction, air and sea temperature, atmospheric pressure etc. 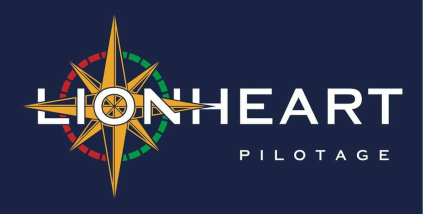 Lionheart is certified by the Maritime & Coastguard Agency to operate in Category 2 sea areas, up to 60 miles from a safe haven. She complies with all relevant safety requirements with life rafts, lifejackets, man over board recovery systems and an EPIRB satellite distress beacon. Such are the capabilities of the boat, Lionheart’s services have in the past, been requested by local Coastguards to assist in Search and Rescue operations.